One of the great agonies every October is that many amateur Halloween events operate only on the last day of the month, making it truly impossible to get to all of them. 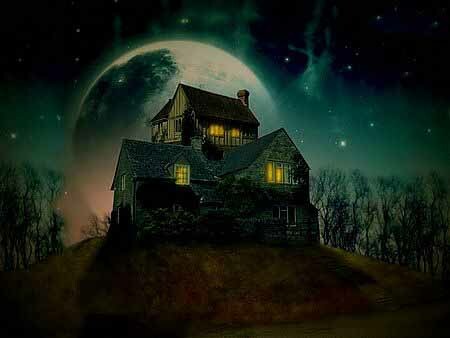 A few open a day or two earlier, but often are not running at full-scale until Halloween Night; attempts to visit them beforehand yields a "preview" experience only hinting at the final result. 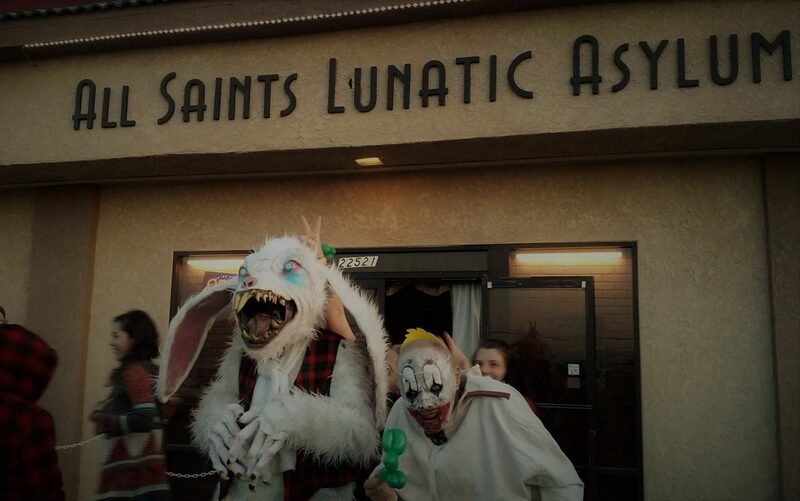 Below is a list of these last-minute yard haunts - basically, anything opening since last weekend that did not appear on our previous list of "2012 Halloween Haunts opening on Friday, October 26." 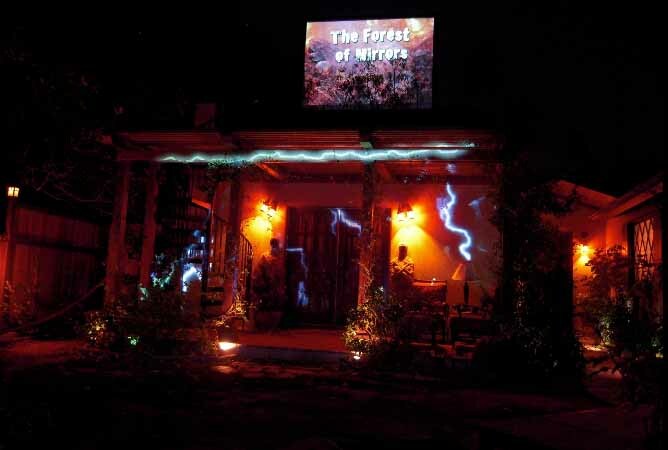 Description: The miraculous mirrored attraction - unique among Halloween yard haunts in Los Angeles - opens its gates once more, on Halloween Night. Located in the back yard of a house once owned by silent movie comedian Buster Keaton, the Forest of Mirrors features a cemetery that seems endlessly extended thanks to a clever illusion: the forking pathways lead to arches, but the arches turn out to be not passages but mirrors; the result is disorienting because the mirrors are carefully placed so that you do not see your own reflection until you are almost ready to step through the looking glass - a startling and remarkable effect. Description: This elaborate yard haunt and walk-through maze – loaded with custom-made props and decorations – got a bit of a jump on Halloween Night by opening on October 30, but we imagine that most of its visitors will be arriving on the 31st. 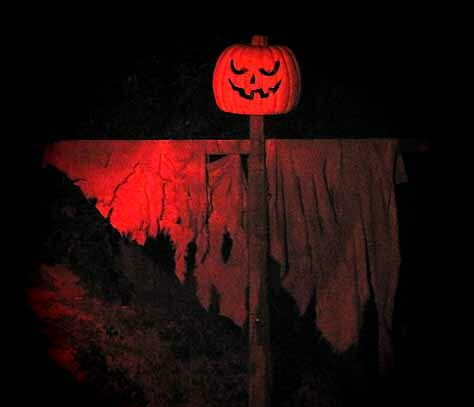 The Simi Valley location is a bit distant for Los Angeles Halloween fans, but if you are anywhere in the general vicinity, the Helizondo Haunt is worth a visit (and you can kill two birds with one stone by visiting Mourning Rose Manor, not far away). Last year’s theme, Rasputin’s Carnival of Risk, actually infused a little vitality into the over-used killer klown canrival cliches, indicating that these amateur haunters know how to put on a good show. Description: Tarzana's as-yet unnamed yard haunt got started on Monday, October 29 (when we visited), but it was still a work-in-progress, awaiting its signature bevy of carved Jack-O'Lanterns to add the finishing touch. The Haunt with No Name Yet is spooky in a wonderfully understated way, with wonderful ornaments, lighting, and a handful of creepy effects. Kids will not be too terrified, but they will enjoy the ghostly tricks-and-treats, as will their parents. Hours: Halloween Night, dusk till the treats run out. 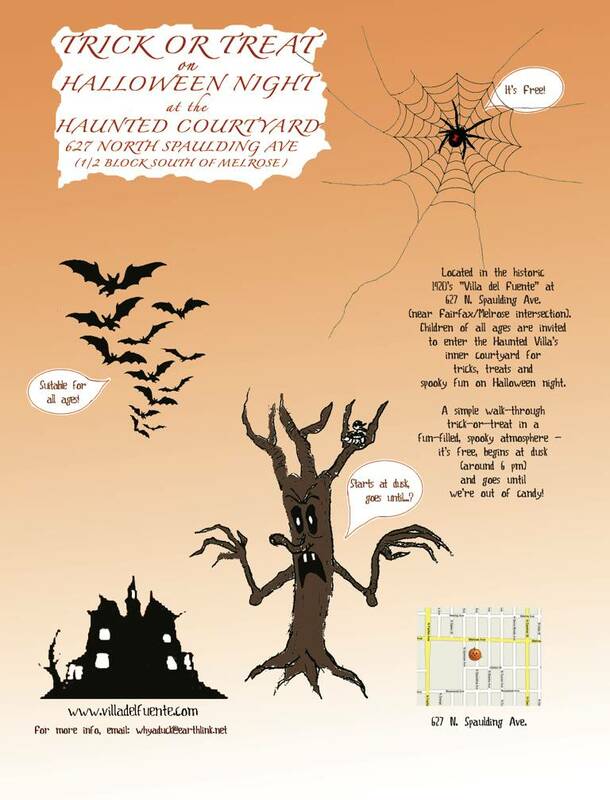 Description: Children of all ages are invited to enter the Haunted Villa's inner courtyard for Halloween fun. 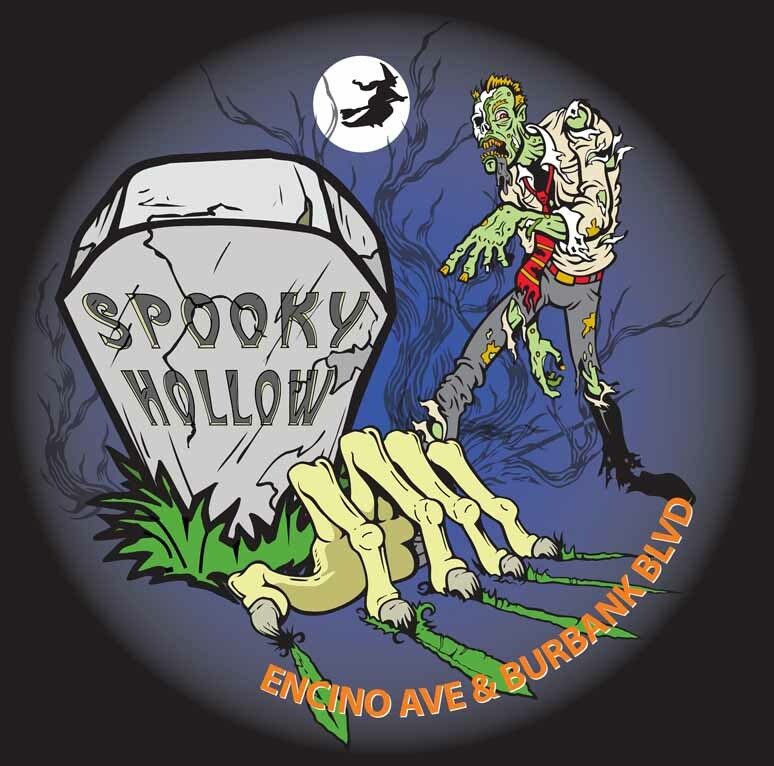 Located in the Fairfax district of Los Angeles, a couple blocks from the intersection of Fairfax and Melrose, this amateur Halloween event offers a simple walk-through trick-or-treat experience with spooky atmosphere and candy. 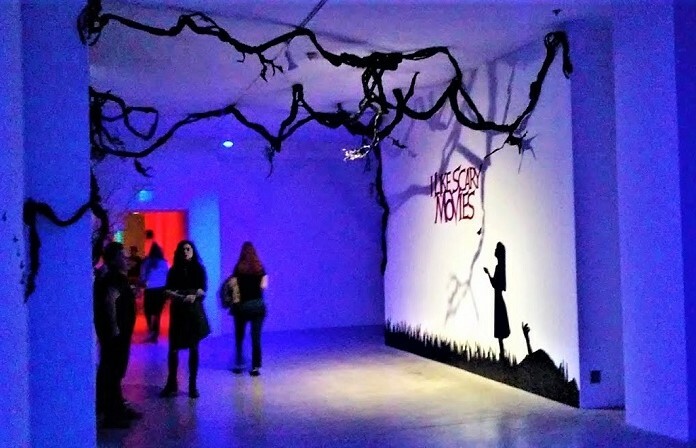 Hours: Halloween Night, 6-10pm (que line closes promptly at 10pm). 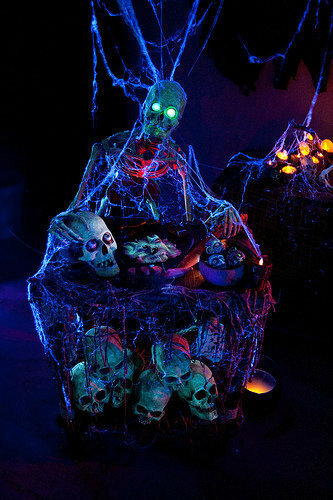 Description: After a last-minute cancellation for Halloween 2011, The Haunting in Anaheim is resurrected in 2012 for its 15th anniversary. 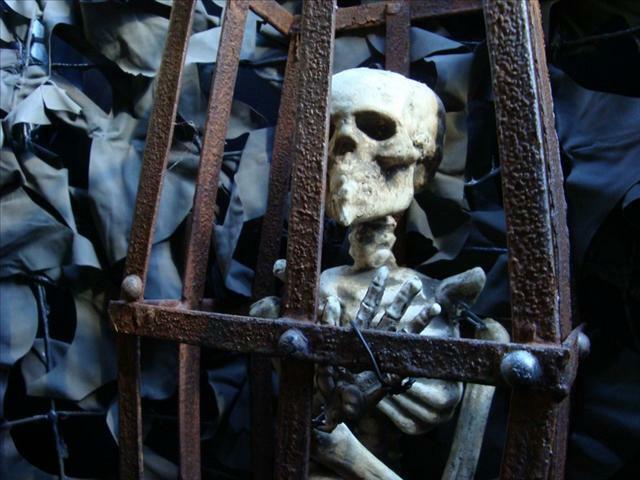 This amateur Halloween yard haunt includes a scary walk-through maze with lots of props. Description: Formerly known as Mishap Manor, this amateur Halloween yard haunt gets a make over for its fifth year of spooky fun. 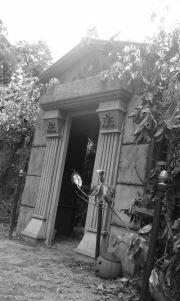 The proprietors have turned their home into a long-forgotten cemetery, complete with gravestones and two large mausoleums. The home-made props are enhanced with sound and lighting. Those who dare may wander through the 150-foot crypt. Note: although the walk-through portion of the haunt is open only on Halloween night, the yard display is typically up for viewing during the last week of October. 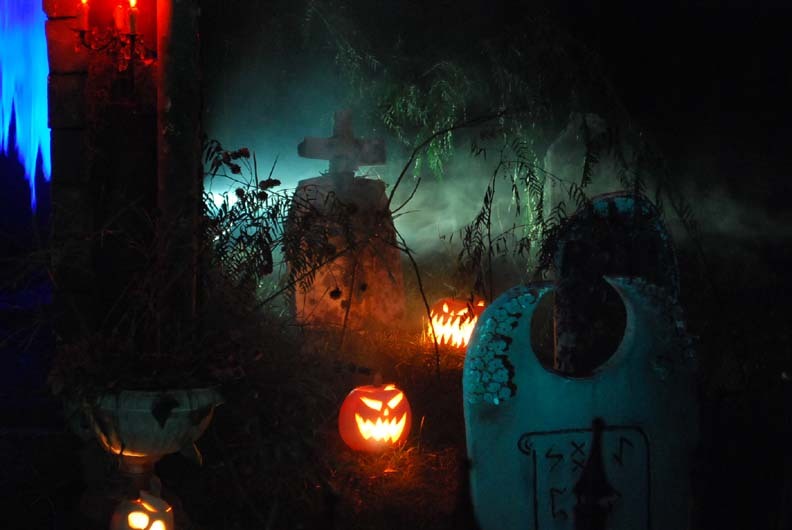 This brand-new haunt made its debut on Monday, featuring a small yard full of tombstones, fog machines, and animatronic figures. For Halloween Night, there will be some costumed characters, but they will not be there to terrifying trick-or-treaters, just to greet them and hand out candy. Spooky Hollow's display is a relatively modest one, featuring off-the-rack effects (figures rising from a toxic waste bin or appearing from behind a tombstone). The plan is to gradually build up over the years into something more custom-made, so show up and lend your support.